Purify Your Indoors Naturally With Vayu Bags ! Hello Sunshine’s, Hope You All Are Doing Well ! Breathing Quality Indoor Air is critical for good health. Most people are aware that outdoor air pollution can impact their health, but indoor air pollution can also have significant and harmful health effect. Understanding and controlling common indoor pollutants can help reduce your risk of indoor health concerns. Most of this air pollution we cause results from the burning of oil, natural gas, maximum odors, air-borne chemicals and toxins, Harmful gases and pollutants of different particle size, tobacco smoke and the smell of paints and cleaning chemicals floating in Airs. But , How To Overcome these harmful pollutants Naturally ? Don’t You Worry , I got you covered today ! Recently, I came across Vayu Natural Air Purifying Bags From Breathe Fresh . It is is the smartest and the easiest way to keep your environment dry, fresh, odour free and to purify your Indoors naturally. The commonly available Air Fresheners do more harm than good. They’re often filled with formaldehyde, chemicals and fragrance that can be carcinogenic and can cause numerous health issues. 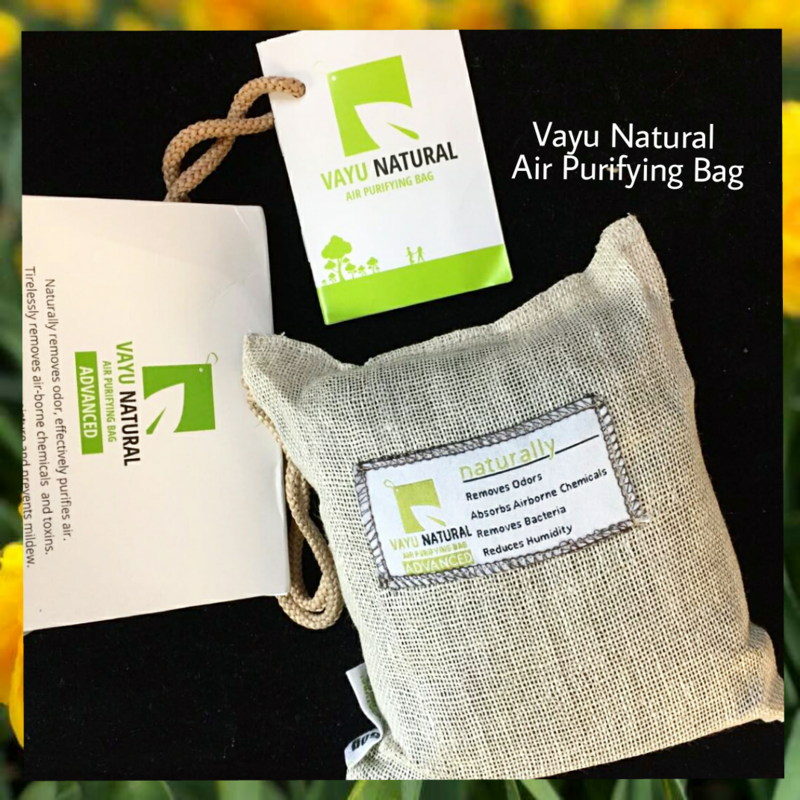 VAYU AIR PURIFYING BAGS are natural, eco-friendly, non-toxic and works 24 hours a day, 7 days a week to naturally clean, deodorize and dehumidify your indoors by tirelessly removing the pollutants and allergens and thus allowing our family to breathe fresh and breathe safely for up to two years. These are the Only air purifying bags with 3-layer technology which gives maximum coverage of gases commonly present in the houses. 1. It Can be hung around the cradle and it would absorb chemicals and odours around. 2. It Can be placed in the washroom and bathrooms. It helps in removing bad odours and absorbs extra humidity, leaving them fresh and purified. 3. It Can be placed where chemicals like household cleaners, mob cleaners etc. are stored. 4. It can be placed with valuables like camera etc. and would adsorb humidity that causes damage. 5. With season change cloth packaging to get away with smell and humidity issues. 6. In refrigerator to avoid smell mixing. 7. Against mold, mildew, bacteria and allergens issues. 8. Can be packed Inside Travel Bags. 9. Perfect for Cars as a Car Air purifier. 10. Specially designed for Indian Homes to remove maximum odors, Harmful gases and pollutants. 11. Effective in making home air purified and Breathable. 12. Made of 100% linen cloth with Powerfully Activated Charcoal. Their mission is to raise awareness about indoor air pollution and promote a healthier life by creating cleaner indoor air naturally. Their solutions are powerful and yet affordable Nature’s hidden secrets. No chemicals, no fancy machinery- just Simple and Sustainable clean living. They have products varying from Air Purifying bags, natural Air purifier with anti-bacterial essential oil, Air Purifying plants and more. Long shelf life of 2 years. Place the bag in direct sunlight, once a month to recharge. You guys can also check their entire range of products and buy either from Breathe Fresh or you can get it from Amazon as well. Do visit the link now & thank me later. This is really helps to keep surrounding clean and fresh thank you for letting us know about this product would like to buy for my home ? This looks like a great and natural way to purify the air in our homes. Now this is what every household needs in today’s polluted environment. Its a nice step from Vayu for coming up with the product. This is a must have product at home now a days because we are struggling to get fresh air even inside our homes. Indoor pollution is a serious threat to our health. Oh that’s great product, thank you for your Amazingggg review! This looks much much better than those machines and other scientific ways. Would love to try them. We should take care of indoor pollution. This vayu bag has activated charcoal and all natural ingredients. Now that sounds a great bag to keep the indoor air fresh, also as the monsoon is coming, we will need something which absorbs excess moisture. Guess it is perfect. In this era of extreme air pollution, this is a wonderful product for breathing fresh air at least inside our homes. Such an amazing idea this is to use organic, biodegradable and safe air purifiers that do not harm the environment! A great initiative! Well this is such a great product for absorbing chemicals and odours.. I have been using it and I love it. Such a useful multipurpose product ? I’m purchasing this for my house too. It’s raining cats and dogs in Konkan so this would be the best to ward off the clothes odour. I really like the concept of this organic indoor purifier. Amazing and informative post. Vayu bag is best for clean and hygiene home. Great thoughts. I would love to try this Vayu bag for indoors purifying and hygiene. Will definitely check this out. This is such an innovative way to purify indoor air in an organic way.. Love the concept.